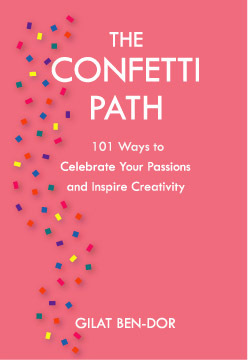 For a limited time, Gilat Ben-Dor is offering signed copies of THE CONFETTI PATH when purchased here. You may already know that you are a creative spirit, but when was the last time you really branched out in the way that you express this creativity? How can you expand the ways of expressing your passions? In this fun and portable new book by Gilat Ben-Dor, experience tips, insights, quotes, and special exercises in every chapter to help keep your passion fresh and your creativity sparkling! Signed Edition.